Indie Retro News: Donkey Kong 3 - Is this Arcade classic coming to the ZX Spectrum? Donkey Kong 3 - Is this Arcade classic coming to the ZX Spectrum? Throughout these last few months we've been featuring a numbers of games that have been entered into the ZX-DEV conversion competition, games such as Gimmick! Yumetaro Odyssey, Gandalf and even Mighty Final Fight, each one aiming for a very decent prize and even a speccy tape called Thrust. 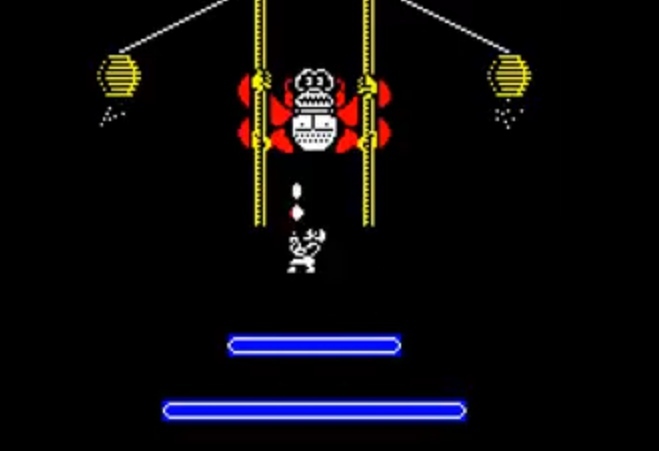 Well the competition is still ongoing, and as of this week a new entry has been added and it looks to be an Arcade to ZX Spectrum port of the 1980's game ' Donkey Kong 3 '. Although there isn't much to go on as only a test concept video has been released above showing what looks like Donkey Kong enjoying himself a little too much. This enjoyable game was originally released as the third game in the Donkey Kong series and was released not just for the Arcades but also the NES. Furthermore rather than playing as Jumpman aka Mario, you play as Stanley the bugman on a mission with a powerful bug spray to stop the ape from stirring up the insects that will destroy his flowers in his greenhouse.